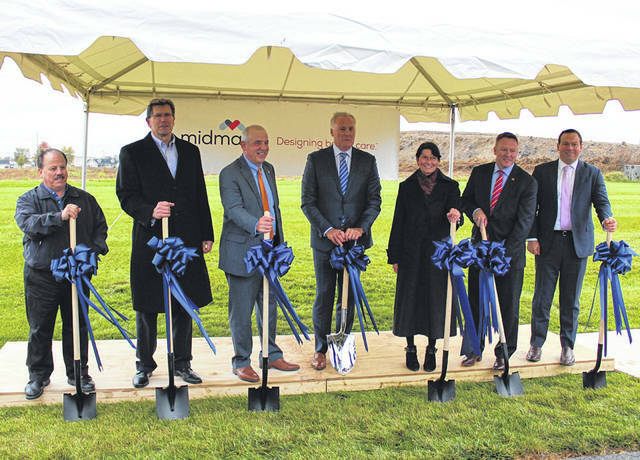 Midmark held a groundbreaking ceremony Friday to begin construction of its latest expansion in Versailles. Wielding shovels were (from left) Versailles Mayor Jeff Subler, Midmark Vice President Karl Weidner, State Sen. Matt Huffman, Midmark President and CEO John Baumann, Midmark Chair Anne Eiting Klamar, Rep. Warren Davidson and JobsOhio Marketing Manager Andrew Deye. Midmark’s expansion project, shown in this artist’s rendering, will include a technology center, experience center and a business center. Completion of the project is scheduled for 2020. VERSAILLES — Midmark Corp. broke ground Friday, Nov. 2, for its 107,000-square-foot expansion project to be built at the company’s Versailles campus. 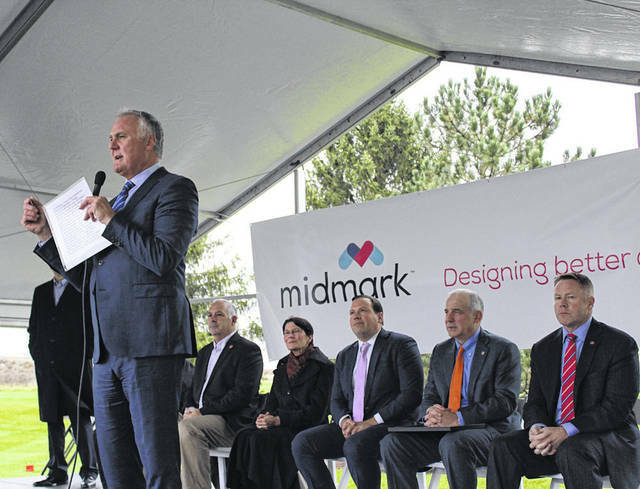 Midmark, a leading provider of medical, dental and veterinary equipment, technology and services, celebrated the milestone with an event that included company teammates, as well as local, regional and state government officials. The expansion will have a technology center, experience center and a business center that reflect Midmark’s commitment to a better care experience. The new space is designed to foster an environment of elevated creativity, collaboration, communication and decision-making the company can harness to help customers improve clinical outcomes. Baumann told those assembled that the groundbreaking was more than just a milestone. Rep. Warren Davidson, R-Troy, 8th District, lauded Midmark’s management and workers, saying they’ve always found a way to thrive, despite what happens with government policymakers. Others on hand for the groundbreaking included Midmark Chairwoman Anne Eiting Klamar, JobsOhio Marketing Manager Andrew Deye, Versailles Mayor Jeff Subler, State Sen. Matt Huffman, R-Lima, 12th District, and State Rep. Steve Huffman, R-Tipp City, 80th District, among other community leaders. 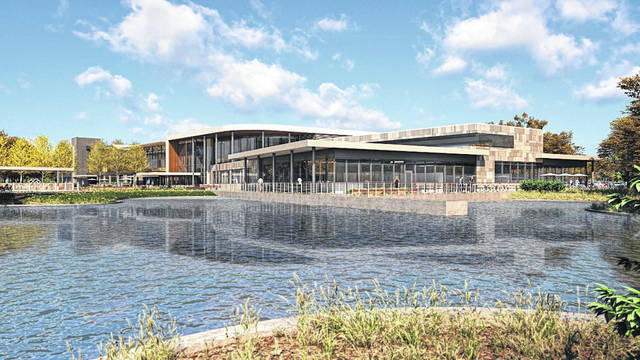 According to Midmark, the centerpiece of the expansion is the state-of-the-art technology center that will become the cornerstone for Midmark’s efforts to change how care is delivered. The center will bring together Midmark engineers, designers and experts from across the company to develop new approaches, innovative technologies and proven solutions to enable a better care experience for caregivers and patients in medical, dental and animal health industries. It also will become a hub for additional collaboration with forward-thinking customers, industry leaders and strategic partners from around the world. Another feature of the expansion, the experience center, is designed for customers, to help them make informed design and workflow decisions to improve clinical outcomes. The experience center will offer customers an interactive opportunity to better understand how best practices and Midmark will provide value within many different healthcare settings. Midmark said construction of the center is scheduled to be completed in the spring of 2020. Reach the writer at 937-569-4314. This entry was tagged groundbreaking, Midmark, Versailles. Bookmark the permalink.